Australian surgeons have successfully separated 15-month-old Bhutanese twins, Nima and Dawa, who had been joined at the torso. 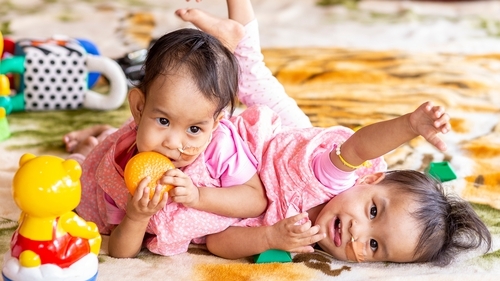 Nima and Dawa, and their mother Bhumchu Zangmo, arrived in Australia a month ago with the help of an Australian charity. However, doctors had delayed the surgery to ensure the twins were well-enough nourished to support the operation. The girls were known to share a liver, but it was not known before today whether they also shared part of the bowel, which would have complicated the surgery. Mr Crameri said the girls' bowels were a bit intertwined they were not connected "in any major way". "It will be really interesting to see what will happen once the girls are separated," Ms Lodge said, adding that the twins were "good mates".